You can listen to Krishna conscious radio stations via smartphones anywhere you get a signal. Tune in to your favorite station while driving to work or school, or anytime really, when you're out and about, smartphone in pocket. There are lots of Internet radio apps for your smartphone of choice. For this tutorial (as of November 2011) we've selected "TuneIn Radio Pro," available on iPhone, Android and Blackberry platforms. The app costs $1 and allows you to record live broadcasts for later listening, a useful feature. 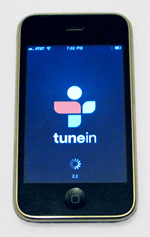 1) Download "TuneIn Radio Pro" from the App Store. 2) Open the app and click on "Browse" at the bottom of the screen. For this test, we'll add the Alachua Temple Live station. 3) Type "Alachua Temple Live" into the search box at the top of the screen. 4) Tap the "Alachua Temple Live" search result. The streaming radio station should begin to play. 5) To record, press the red record button. To stop, press the square stop button. To listen to your recording, tap the back arrow icon at the top left of the screen and select "Recordings" from the tabs along the bottom, then select the recorded audio file. 6) To add the station to your Presets (favorites), press the heart icon at the top right from within the station details window. Search for "Kirtana" and you'll find "Kirtana Radio," an ISKCON Delhi station playing kirtana recordings from ISKCON singers worldwide. See their station info.